I saved the best for last. I think this is my very favorite product. At our house, my husband and I are pretty picky about a clean kitchen. We are both CONSTANTLY cleaning the counters. I also hate a dirty bathroom counter and sink. As a result, we used a lot of antibacterial wipes to do spot cleaning. There is not a lot wrong with this in the bathroom (other than the expense) but I never felt great about using them in the kitchen because of the chemicals in them. This product is a GLORIOUS alternative. I absolutely love them. They smell heavenly, are a fraction of the cost of antibacterial wipes and I feel very good about using them on the surfaces that might come in contact with food. First you will need the right sized containers for this. You will need something that is big enough around to handle the diameter of a paper towel roll. It will need to be at least half the height of a paper towel roll. I found a two pack of plastic containers at Walmart for $2.88. Since I wanted to make one set for the kitchen and one set for the bathroom, this was perfect. The first thing you do is cut a roll of paper towels in half and take out the cardboard core. At first, I tried to use a serated bread knife which just mangled my paper towels. I ended up using a sharp Chef’s knife that cut right through everything. The cardboard core comes out easier than you might thing. If you can find an edge to un-peel it, that helps get it out. Otherwise just work it out slowly without pulling the center of the towels out. 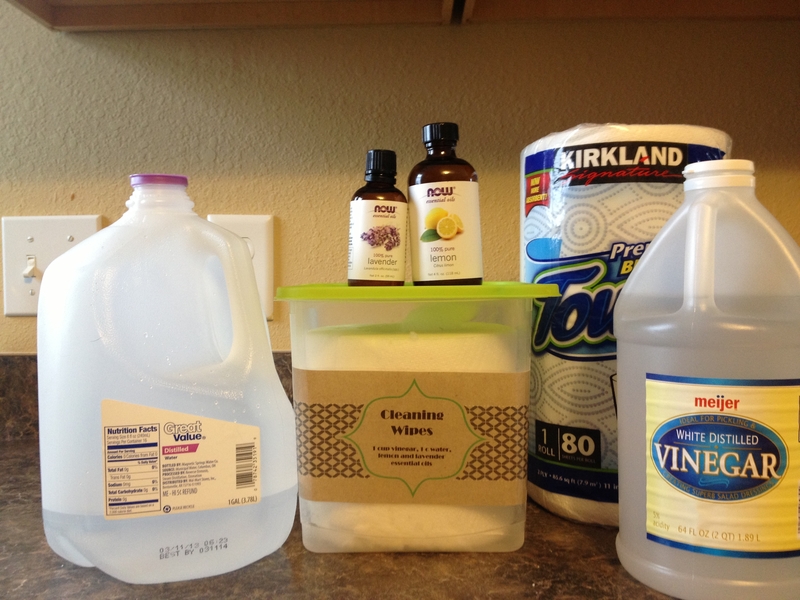 I use Kirkland brand paper towels from Costo. They are a pretty durable paper towel and I think this is important because they have to hold up to the moisture of the solution. If you aren’t a bulk shopper, just pick a sturdy towel. Since you are already using just half a sheet for each one (since you are cutting the roll in half), I don’t recommend the “select-a-size” type towels. Mix all the liquid in the bottom of the container you will store them in. Take the half roll of paper towels (already de-cored) and put it into the liquid. It will quickly soak up the liquid in the bottom of the container. Put on the lid and turn the entire container upside down. In a couple of minutes, the entire roll will be saturated. Just pull the “wipes” out from the center. I picked this variation mostly because I love the lemony small of furniture polish. Since this product does not have vinegar in it, I will keeping a close watch on it to make sure it doesn’t start growing things. I have a feeling that this one will have a shorter shelf life because of the ingredients. For this reason, it makes sense to make a small amount at a time. This makes 4 oz. so a small spray bottle (I found mine in the travel sized toiletry section) works great. This is another product that has lots of variation. The simplest recipe is equal parts vinegar and water. However, many recipes call for either rubbing alcohol or “other” alcohol like vodka. I believe the alcohol is important to reduce streaking because it helps everything evaporate. 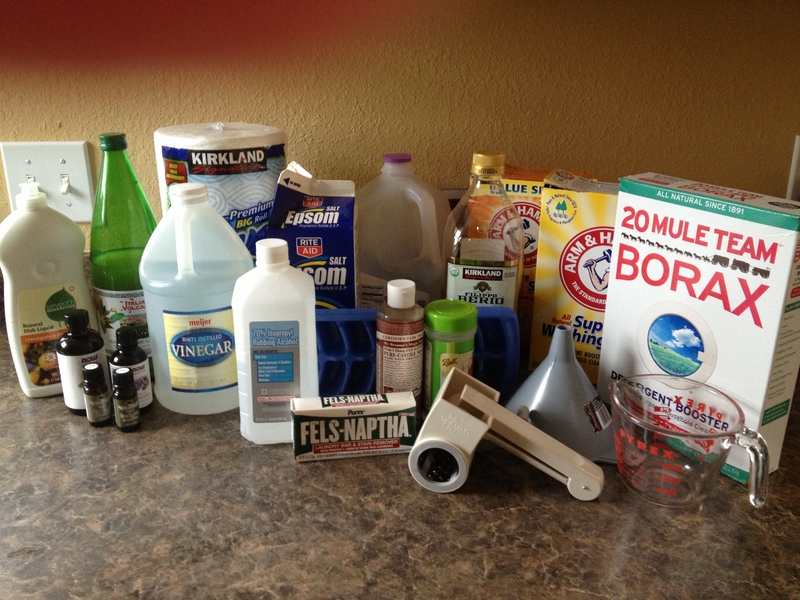 However, some sites assert that rubbing alcohol is a caustic chemical that shouldn’t be used. These people fall into the vodka camp. I just couldn’t bring myself to waste perfectly good vodka on my mirrors so I went with the less expensive rubbing alcohol. This is another favorite. I put this product to the test right away on the day that I made it. I decided that my Easter present to my teenaged daughters would be to clean their bathroom for them. I NEVER clean their bathroom and it is the source of much tension and conflict between them. The result…nobody seems to clean it. This job definitely put my cleaning products to the test. I used the soft scrub on their tub and sink and just about every surface in the bathroom. I just scooped some out onto a damp sponge and started scrubbing. I couldn’t believe how well it worked. A little bit went a long way, which was also very surprising. I store this in a wide mouthed quart size Mason jar. After about a week, I noticed it was starting to get thicker, so I assume it would eventually dry out if not used. I just added about a Tablespoon of water and remixed it and it was fine again. I don’t use Soft Scrub much because I tend to keep up on things like sinks and tubs. When you keep up on them with All Purpose Cleaner or Cleaning Wipes, the Soft Scrub isn’t necessary that often. However, I do like a sparkling sink and this works great. Mix all ingredients EXCEPT the vinegar into a paste (should be the consistency of frosting). Once everything is mixed, add in the vinegar. 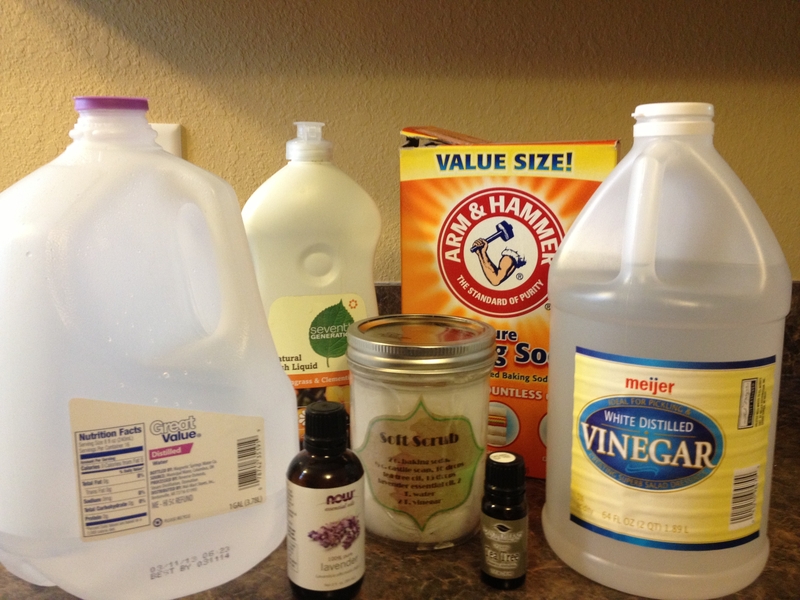 The vinegar will react with the baking soda and will make everything foam up. Mix well and store in an air tight jar. I. Love. This. Cleaner. It takes about 2 minutes to make. It smells great and it cleans really well. The best part is that I can spray it all over my kitchen counters and not worry at all about whether it will come in contact with food. 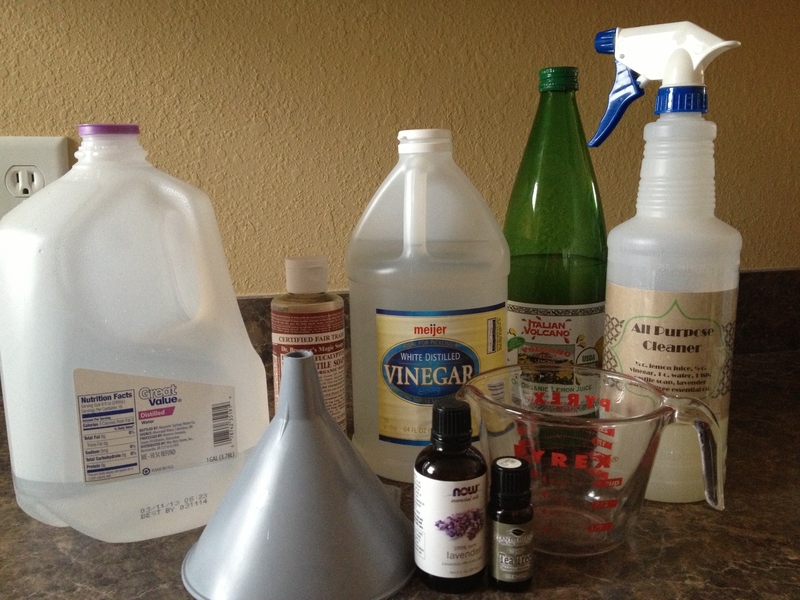 For this cleaner (and the other liquid cleaners), I recommend getting a kitchen funnel if you don’t have one. I needed to buy one and the funnels I found in the kitchen aisle were expensive. So I went over to the auto parts aisle at Walmart and found a small funnel for $0.98 that is perfect. I also had to buy a spray bottle for this. I found empty spray bottles in the cleaning supply aisle for $0.98. Although this recipe does not fill the bottle, I have not doubled it yet because I want to make sure the shelf life is long enough to last through a double batch. Just pour all the ingredients in a bottle and shake. 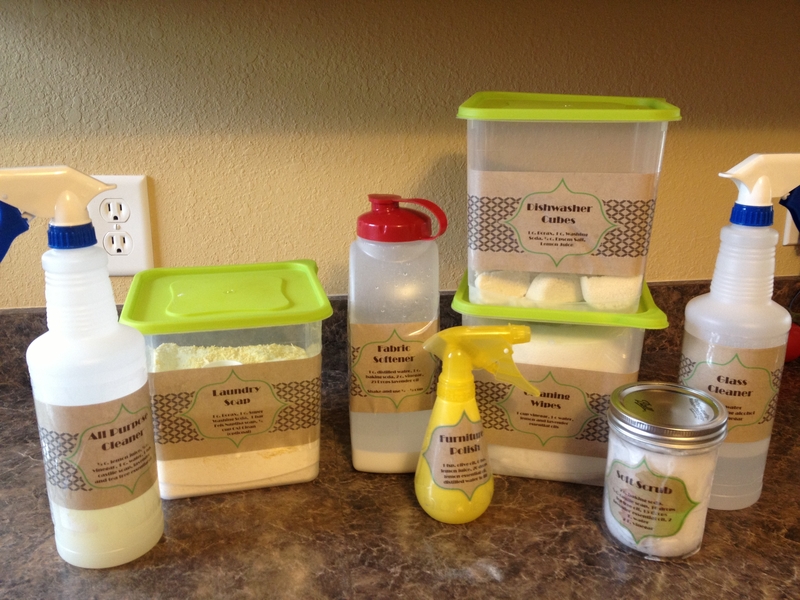 The castile soap and essential oils are listed as optional on the recipe I used. I LOVE the smell of the oils so I did add them. When I originally bought the oils, I bought lemon, lavender, tea tree and eucalyptus. If you just want the basics, I would stick with lavender and lemon. I will use tea tree as long as my original bottle lasts and then will probably switch to lemon. Also, castile soap is an all natural soap that is great. It is also VERY expensive. We had enough on hand for this so I used it. If you don’t have it, you could either substitute dish soap or just skip it. This is one of the first things I found, and the product that has required the most experimentation. We have used detergent “cubes” in our dishwasher. They are more expensive but I just like the simplicity. 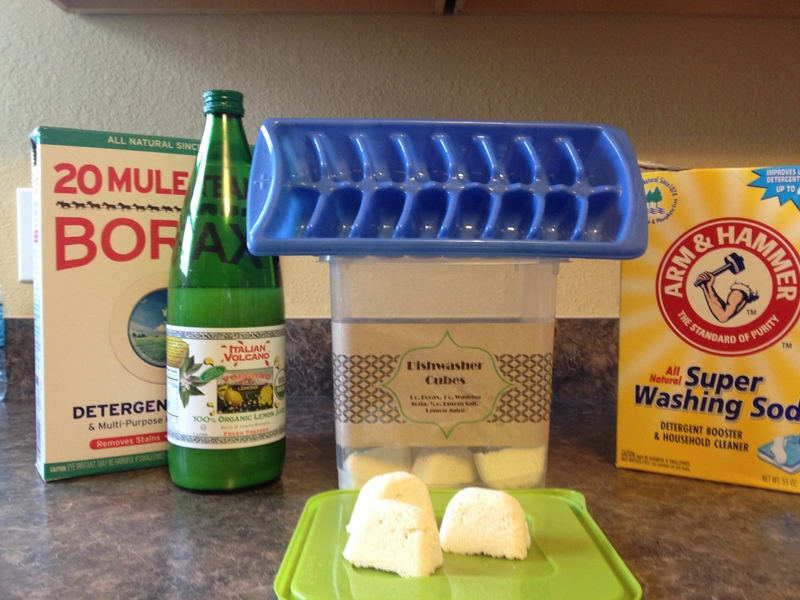 So when I saw a recipe for dishwasher soap cubes, it looked kind of fun. The first mistake that I made is that I bought ice cube trays that made cubes that were too big for the soap compartment in my dishwasher. I didn’t think this would matter because the blogs I read said to just toss the cube in the bottom of the washer. Unfortunately, my dishwasher has a rinse cycle that would dissolve all the soap and then drain it so there was nothing left by the time the wash cycle started. This little problem requires me to stand next to my dishwasher while the rinse cycle goes, then open it up after it drains and as it is filling back up for the wash cycle. Not only is this a pain, but I have some sort of attention deficit disorder and NEVER get this right. It took me 3 tries and 3 cubes to get it right one morning. Long story. The solution is to buy small ice cube trays and test them first. 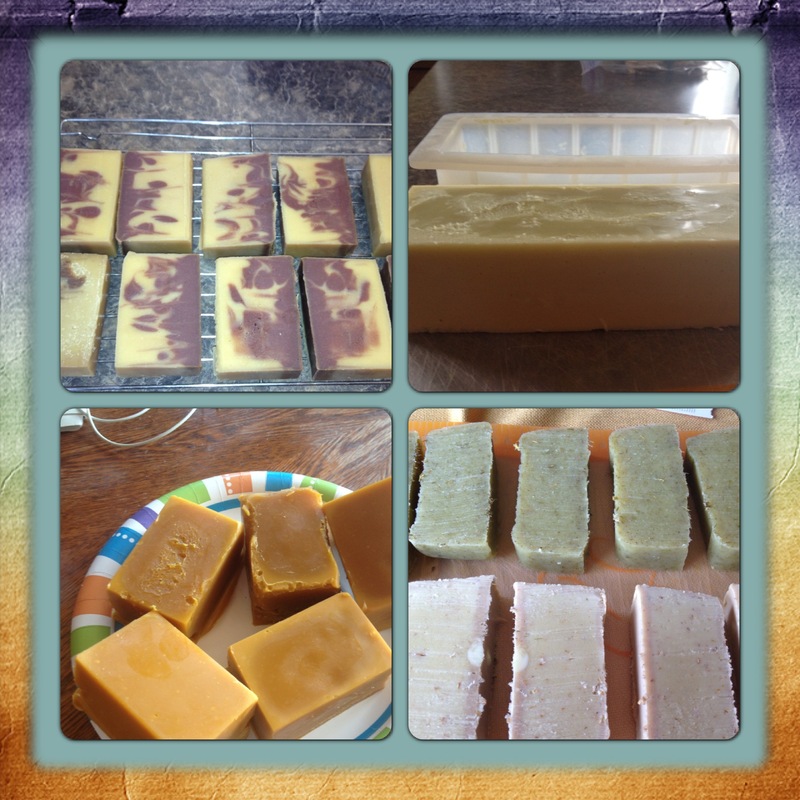 I made ice cubes in the 2nd set of trays, then took an ice cube and made sure the soap compartment would close. 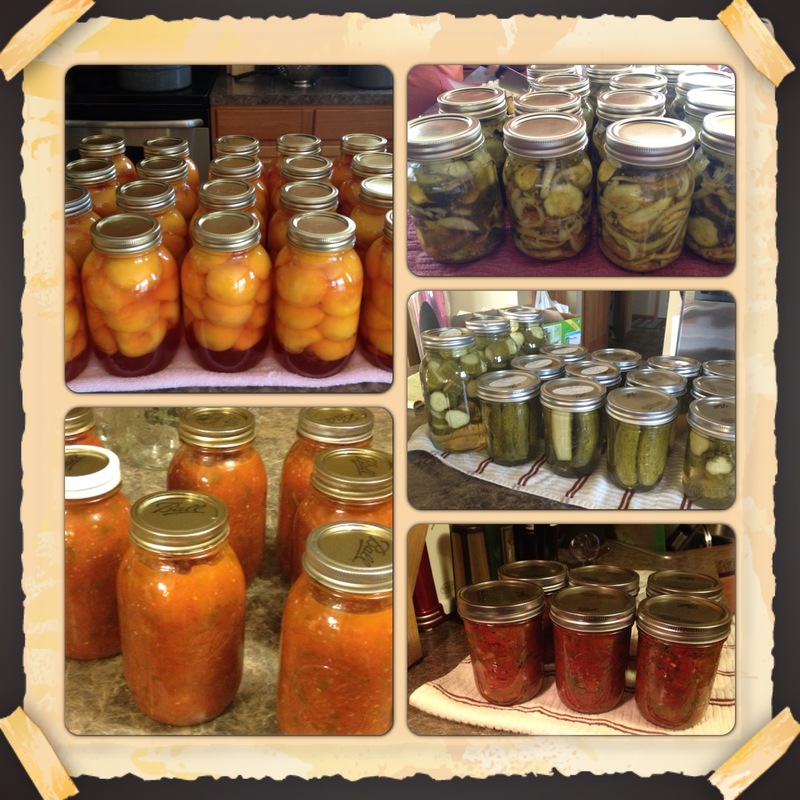 Now I just have to use up the first batch that I made. If you don’t want to mess with this, I will give you the powder alternative at the end of this post. Mix the dry ingredients first. Then mix in the lemon juice so it is a wets all the dry ingredients and is mixed well. Put scoops of this in ice cube trays and press down. Let the mixture dry overnight. I got over-eager in the first batch and tried to take them out after a couple of hours because they seemed dry on the top. Those crumbled a lot. The ones that I let sit overnight popped out of the trays very easily the next morning and didn’t crumble. After using this for a few loads, we noticed that there was a film on the dishes, especially the plastic ones. 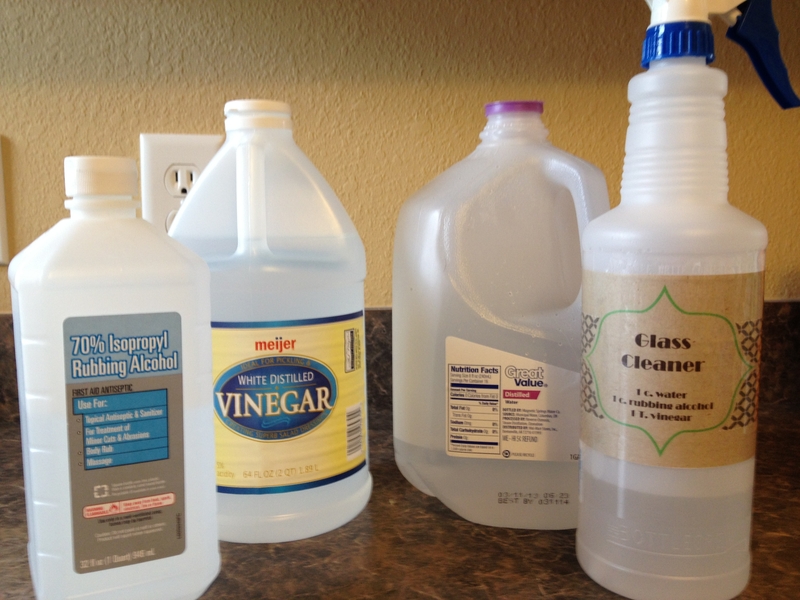 So I researched some more and discovered that vinegar is a great rinse agent. I poured some in the rinse agent compartment in my dishwasher and the next load came out perfect. 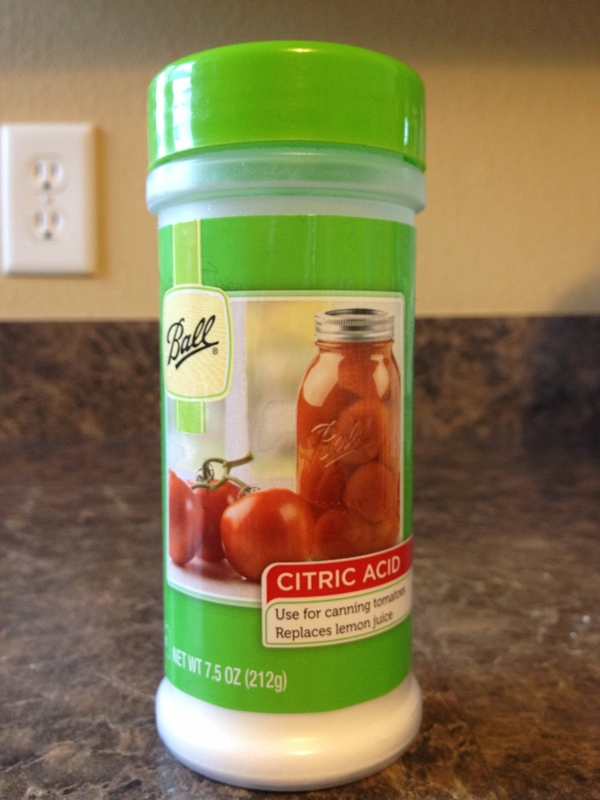 If you want the dry powder alternative, use ½ cup of citric acid (found with canning supplies at the grocery store) instead of the lemon juice. 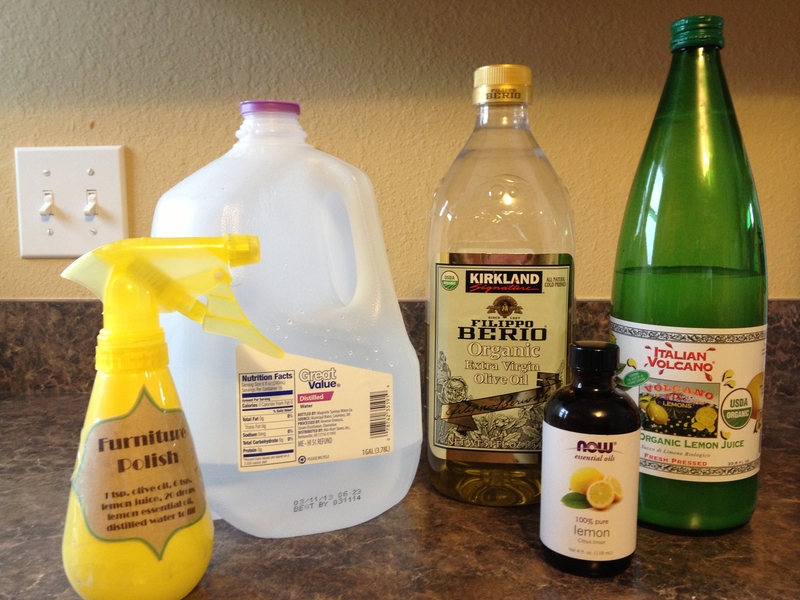 Citric acid is about $3 for 1 cup so it is more expensive than using lemon juice which I always have on hand. September 2013 Update: I am still looking for a recipe that really works. I have seen lots of posts out there with this (or a similar) recipe and they claim it works great. But even with vinegar in the rinse compartment, my dishes still had a film. I really like sparkling glasses, so am not using this anymore.